As covered in a previous article, lowering the prices of your products does more harm than good, but what do you do if you just can’t sell your products at the prices they’re at? If the time it takes you to make a product and the materials you use are pricing you out of the market, consider changing a few details of your business. Don’t keep doing what you’re doing and simply lower the price; make some changes to lower your costs first or change up your tactics to keep your prices the same but generate more sales. 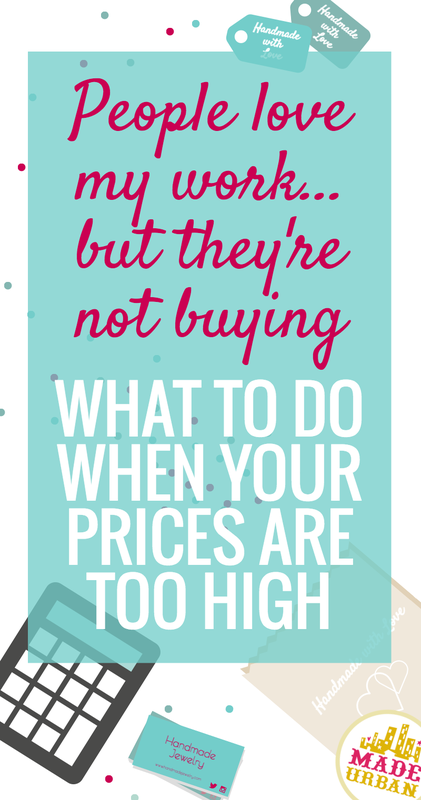 Below are 11 tips you can try if you think your sales are low due to your prices being high. If you’re currently working with top of the line materials to ensure your products are of the best quality but sales are a little slow, you may want to try using materials that aren’t as expensive and will bring your costs down. If your shoppers are aware you’re using the best in quality but don’t end up buying, they may care less about your high-end components than you think. Try the same designs in materials that aren’t quite as expensive and see if that helps sales. Typically people shopping at an event like a Farmers’ Market aren’t ready to drop a few hundred dollars on the spot, so if you’re pricing calculations are correct but you’re not doing well selling through one platform, try another. Your high-end products may be better suited for a different type of craft show, selling online, or wholesale through a boutique. It doesn’t matter what the price of your products are (high or low), if you’re putting them in front of the wrong audience, they won’t do well. Be sure you’re advertising and selling in a place that reaches your target market. Costs x 2 = wholesale price. Wholesale price x 2 = retail price. This is a good place to start when deciding on prices, but it won’t work for every business. Some products just don’t have a high enough profit margin to be sold at wholesale prices. If your prices are getting too high by setting a wholesale price that allows you to profit when you sell to boutiques, and then doubling that to get the price you’ll charge when selling directly to consumers, perhaps selling wholesale to retailers isn’t a good option for your business. If you only focus on selling directly to consumers through craft shows and online sales, you may find that you’re profiting enough by simply charging customers the wholesale price or somewhere between the wholesale and retail price you get from that equation. Adding fewer details to your work means you spend less time and materials and can ultimately lower your price or keep prices the same and increase your profits. Skip all those detailed pockets inside your handmade purses and just have one or two for keys and lipstick. You don’t want to take away the special touches that make your work unique but before you add on a feature, ask yourself if customers will care about it enough to warrant the higher price tag. This will come with time as you improve your skills but there are little things you can do to break the process into steps and prep in bulk (just check out how I lowered my production time by implementing a few tactics). If you’re sewing your products, perhaps you can break your steps into cutting, serging, sewing and detailing. Instead of going back and forth between stations and tools, complete cutting for 20 pieces at a time, then move onto serging those 20 pieces and so on and so forth. You may offer the same piece in a higher and lower-end finish. This not only gives the shopper options, it will help them see the value in the higher end pieces. However you do need to be careful with this strategy; don’t mix the lower-end pieces in with the high; make sure you clearly define that the lower-end products are a separate line and point out the value in the higher end ones. No, that’s not a typo. It may also be beneficial for you to cut back on how many product options you offer. I know that one of the best parts of running a handmade business is dreaming up new product ideas and never really having to make the same item twice. But that’s generally not a profitable business model. You can switch up colors, fabrics, materials, etc., to keep things exciting, but when you can follow the same pattern and techniques to make all your products, it speeds up production. When I started my handbag line, there weren’t two bags that looked alike. I not only lost sales, because someone would see the cross-body bag as they passed my craft show table but when they circled back around it was sold and I didn’t have another one for them. I also lost time. Although time flew when I was sketching new designs, shopping for new fabrics I would use, perfecting the pattern, etc. I was being incredibly inefficient. When I found my niche with the weekend bag, I had two patterns to follow (the large weekend bag and small weekend bag), knew exactly how much material to buy (and could buy it in bulk to get discount pricing and save on trips to the fabric store), the steps to follow to make the bag, and I became quicker and quicker at making it. Be sure you’re choosing the right craft shows you participate in; same goes for the boutiques your products are in. Instead of signing up for every craft show in your area, take the time to research which ones have great organizers to ensure (as much as you can) that it will be a good show. Check out the article on red flags to watch for and questions you should ask before committing. This way you won’t be wasting time, money and stock on shows or boutiques that don’t turn a good profit for you. What do you spend a lot of time on and how much do you profit from it? If you’re spending 2 hours a day sending emails but nothing ever comes from them, consider using the BCC field to send the same message to multiple prospects or creating canned responses for the questions you get the most. If there’s a product that takes you a lot of time to create but you rarely sell it, consider scratching it from your product line (even if it’s your favorite). Narrow that down even further and think about whether there’s one component of your product’s production that takes up a lot of time to incorporate; are shoppers noticing this feature or buying because of it? If not, you may want to consider taking it out or testing a few products without the time consuming element to see if people really miss it. Don’t get stuck in thinking that just because other businesses do things a certain way or because you’ve always done things one way, you have to continue to do so. Business is all about change and adapting to your market. If you’re not sure what your “bottom line” is, check out this article. Be sure you’re thinking of all the little things when it comes to your business and where there are opportunities to reduce your costs. Use up the stacks of material in your storage bin before going to purchase more. Plan ahead so you can buy your materials in bulk and take advantage of discounts. Don’t make 5 trips to the post office a week; set a day to send packages out and save time and gas. Take good care of your tools so you don’t have to replace them every 6 months. Decide whether those expensive price tags you use are essential to your brand or if you can find a cheaper option. These things may seem small, but over time, they’ll protect your bottom line and save you money. Shoppers may not understand the value of your products, in which case, it’s your job to educate them. If your prices are higher than other vendors selling similar items, be sure you’re communicating the reason why to shoppers. If you’re using 100% organic, locally sourced ingredients when others typically don’t, mention that on your tags, your signage and in your sales pitch. If shoppers don’t understand your prices, they won’t be willing to pay them. 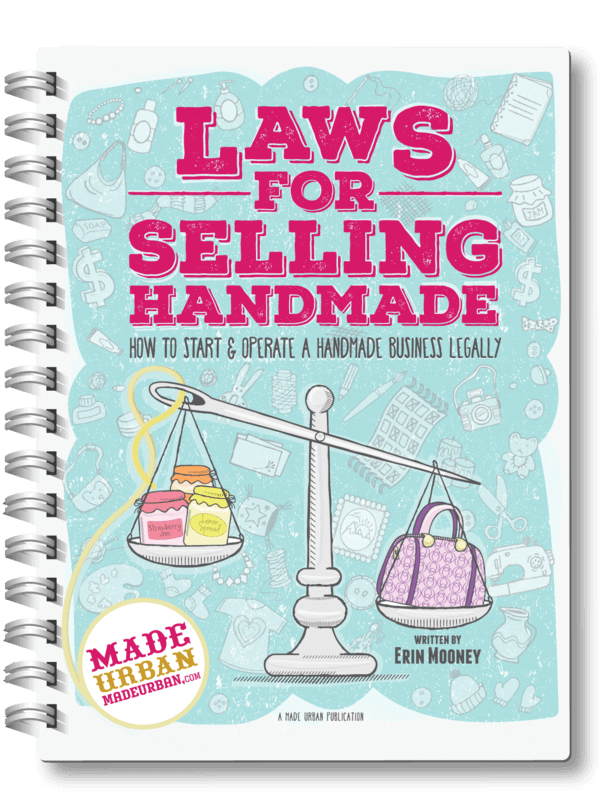 If selling is not your strong point, you’ll find a lot of useful pointers in MAKE MORE MONEY AT CRAFT FAIRS and how to craft the perfect sales pitch that points out the features your shoppers actually care about. As well, I share tons of tips that will put the most anxious vendor at ease and feel comfortable selling (especially if you’re an introvert like me…and if you are, check out this one THE SUCCESSFUL INTROVERT – HOW TO MARKET & MANAGE A CREATIVE BUSINESS WHEN YOU’RE QUIET, SHY OR INTROVERTED). What does your display at craft shows look like? What about your labeling, photography and packaging? If your products are tossed down on a table with prices scribbled on them and no thought put into presentation, shoppers are not going to put much value on them. Take those same items and put them into nice packaging with a well thought out label, display them beautifully, handle them with care, etc. and watch how much more attention and sales they’ll get. Online, you need to portray this same feeling through your photos, titles and descriptions.